Locality: United States, Colorado, Boulder, Near Boulder. 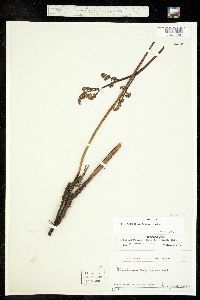 Notes: Pteridium aquilinum (L.) Kuhn var. pubescens Underw., det. by W.A. Weber, 1946. / Pteridium aquilinum (L.) Kuhn ssp lanuginosum (Bong.) Hultén, det. by W.A. Weber, no date. Original ID: Pteridium aquilinum.